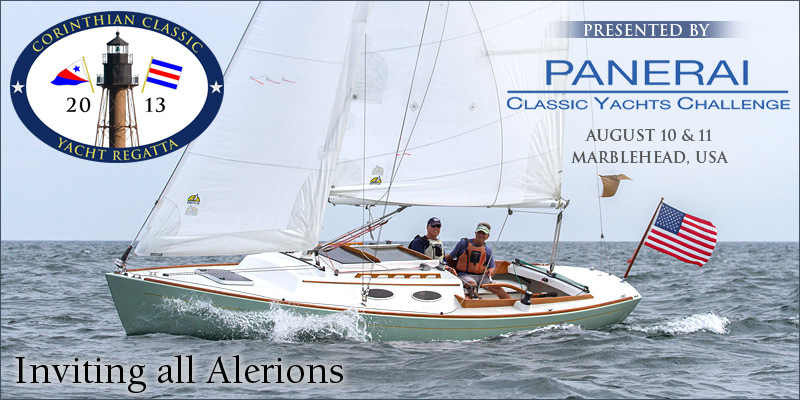 The Corinthian Classic Yacht Regatta presented by Officine Panerai (www.panerai.com), would like to invite all Alerion yachts to participate in the festivities Saturday and Sunday, August 10 & 11. This a rare opportunity for Alerion owners to gather and sail your boats in a Corinthian spirit and taking part in what has become a mainstay for classic yacht designs and sailing enthusiasts. To date there are two Alerion Express yachts entered and I'm sure you'll want to fill out the "fleet". Congratulations to last year's Alerion winners DeWitt Brown in his Alerion 28, "Lumen Solare"; Allessandro Pagani in the Alerion Sport 33, "Nina"; and Hoff Stauffer "Amazing Grace" and Alan Bell "Maia" who tied for 4th OVERALL (out of 68) in their Alerion 38's. The tie breaker went to "Amazing Grace"
The racing is "low key" but it is an excellent opportunity to stretch your sea legs. You can expect that the Corinthian Yacht Club along with Panerai will put on a good show on and off the water for a very reasonable cost including free moorings (First come. First Serve.). The skippers bag is unbelievably good! ; ) As an added feature, the Marblehead Maritime Festival will be in full swing (not to mention free moorings for the weekend). The Alerion is an absolutely gorgeous, timeless design. A Classic yacht regatta without a few Alerions' on the line just wouldn't be "proper". This year's Corinthian Classic will be held August 10th & 11th. Instructions to enter can be found on our website at www.corinthianclassic.org.